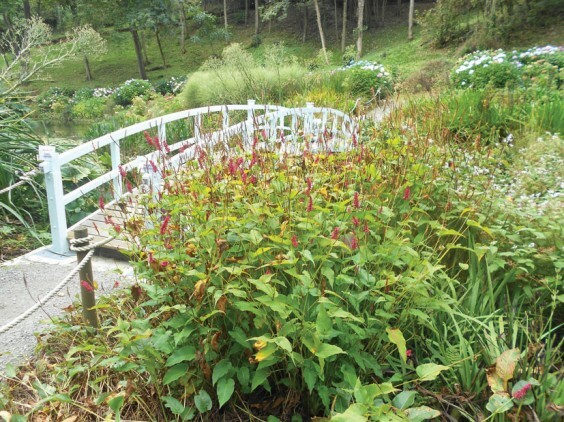 Hannah Genders visits a woodland garden full of sub-tropical planting. The one thing I never seem to get round to doing enough is visiting gardens, and yet when I do I often find them really inspiring, both personally and in my work as a garden designer. Earlier in the autumn I had the perfect excuse to visit a garden I had read about but not yet had the chance to see. I was invited – by a client for whom I am currently doing a garden in Portishead, near Bristol – to come down to Cornwall and visit Trebah gardens near Falmouth. The reason she particularly wanted me to see Trebah is that she had found it very inspiring and felt it was a similar setting to the garden we are doing at Portishead. Both gardens are predominantly a woodland site; both are set in a steeply-sided valley that runs down to a secluded beach. I could see the comparisons as soon as I visited Trebah. Like most gardens in Cornwall, Trebah benefits from the mild local climate, allowing for sub-tropical planting to thrive – and, as one of the gardeners informed me, for grass cutting to continue right through the winter. . . it only slows down a bit. The garden is accessed from a top lawn by the entrance; this slopes down to the first layer of planting which is predominately gunnera. The gunnera plants, which look like a large rhubarb, love the warm microclimate and the leaves had grown so large when we visited that you could easily walk underneath them – it was really impressive. They make an ideal streamside plant as they like to have their roots sitting in boggy ground, and we would like to use them in the same way at Portishead. They are tender and can suffer in a cold winter; the way round this is to cut the large leaves off as they die back and layer them over the vulnerable stems, giving some frost protection during the worst of the winter weather. As Trebah is essentially a woodland garden, it has a high backdrop of trees, underplanted in the top section with rhododendrons. These would be spectacular in the spring when they are all in flower, and the guide informed us that some of them were more than 100 years old. We are planning a rhododendron walk in the garden at Portishead and for this I will use the woodland azaleas, which are a little more subtle in form and flower colour. One of the main things I found inspiring about the planting at Trebah was the use of leaf colour and texture. This is really well done there, as the borders concentrate on subtle greens and dark purples without the dominance of flowering plants. There was one area where this was achieved with succulents and agave plants, which would only survive in a protected environment. However, I can copy these ideas at Portishead, using Heucheras for the purple leaves and grasses for the upright shapes and textures – when this is all put together it will create a very dramatic and unusual planting. Further down the garden path at Trebar as it becomes more shaded, there are ferns; the common ferns which we would all recognise and the wonderful statuesque tree ferns. There must be thousands of plants crammed into the valley, all jostling for space and attention. As you near the bottom of the valley and before you reach the secluded beach there is a whole section of hydrangeas, hundreds of them, and I’ve never seen them planted en masse like this before – the effect is simply stunning! We can think of hydrangeas as a fairly standard, even boring shrub but to plant them on this dramatic scale is impressive. Along with the inspirational planting, the valley at Trebah holds a series of pools with a stream running between them, exactly the same as we are creating at the Portishead garden, so lots of ideas to mull over and take away for our project. If you do find yourself down in Cornwall over the Christmas break do take time to visit Trebah – it sits on the Helford River near Falmouth and is open every day from 10am.